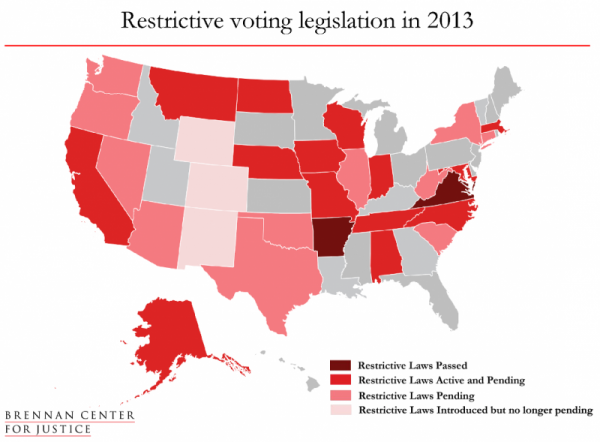 Seventy-five new voting restrictions have been introduced in 30 states in 2013. North Carolina is leading the way. The voter suppression efforts that spread nationwide during the last election have continued in 2013. Seventy-five new voting restrictions have been introduced in thirty states so far in 2013, according to the Brennan Center for Justice. Among all the states, North Carolina, which elected a Republican legislature in 2010 for the first time since the McKinley administration and a Republican governor in 2012, is currently taking voter suppression to brazen new extreme. North Carolina Republicans have introduced a series of bills in the legislature that would require state-issued photo ID to cast a ballot, drastically cut early voting, eliminate same-day voter registration, end straight-ticket voting, penalize families of students who register to vote where they go to college, rescind the automatic restoration of voting rights for ex-felons, and ban “incompetent” voters from the polls. The legislation has been dubbed the "Screw the Voter Act of 2013” and "The Longer Lines to Vote Bill." The goal is to make this racially integrated swing state a solidly red bastion for the next decade and beyond. 1. Requiring state-issued photo ID to cast ballot. Under legislation introduced yesterday, a government-issued photo ID, a state employee photo ID or a student ID from a public university would be required to vote. The strict voter ID law would go into effect in January 2016, just in time for the next presidential election. Voters over the age of 70 would be able to use the ID they had when they turned 70, even if it’s expired, which brings to mind the days of the “grandfather clause” that was used to disenfranchise blacks following the end of Reconstruction. Other states with strict voter ID laws provide a free state ID (even though the underlying documents needed to obtain the ID, like a birth certificate, cost money), but in North Carolina the voter ID would cost $10, which is eerily reminiscent of a poll tax. A free ID can only be obtained by signing an affidavit, under the penalty of perjury, citing financial hardship. “How is somebody going to know they are signing an affidavit that is going to open them up to possible perjury convictions?” asks Anita Earls, executive director of the Durham-based Southern Coalition for Social Justice and a prominent civil rights attorney. Twenty-eight percent of African-Americans and 34 percent of Latinos live in poverty in North Carolina. Over 7 percent of registered voters in North Carolina, 481,109 to be exact, don’t have a driver’s license or a state-issued photo ID, according to the state’s own data. Fifty-five percent of registered voters without photo ID are Democrats. African-Americans make up 22 percent of registered voters in the state, but a third of all registered voters without ID. Exit polling conducted by Southern Coalition for Social Justice in six counties in 2012 found that 8.8 percent of voters had no form of photo ID and that a majority of those who lacked any photo ID were African-American. 2. Cutting early voting. New legislation would reduce the early voting period in North Carolina from two-and-a-half weeks to just one week and would eliminate voting on the last Sunday of early voting, when African-American churches hold “Souls to the Polls” get-out-the-vote drives. The legislation would also limit early voting locations to one site per county, which is a recipe for much longer lines. In Charlotte’s Mecklenburg County, for example, there were 22 early voting locations in 2012. 3. Ending same day registration during early voting. Over 155,000 voters registered to vote and voted on the same day during the early voting period in 2012. “Voters expressed their satisfaction and gratitude that North Carolina had a process that afforded citizens with more opportunities to register and vote,” said a 2009 report from the state board of elections. Ending same-day registration will almost certainly decrease voter turnout in North Carolina and make voting more inconvenient. 4. Penalizing parents of students who register to vote where they go to college. The most extreme proposal of all the new voting restrictions would eliminate the $2,500 child dependency tax deduction for parents of college students who vote where they attend school. “This would mean that voter drives, marches to the polls (i.e. anything that inspires a young person to exercise their constitutional right in their college town) will carry a hefty tax penalty for their parents,” writes Rob Schofield, policy director of NC Policy Watch. This harsh penalty for student political activity is likely unconstitutional. 5. Disenfranchising ex-felons. New legislation would prevent ex-felons from receiving their voting rights after serving their time and would instead force them to wait five years, apply to the board of elections and receive unanimous approval in order to re-enter the political process. “Approval depends on the unanimous consent of local board of elections members and two affidavits from local voters about your ‘upstanding moral character,’” writes Bob Hall of Democracy North Carolina. Five times as many blacks as whites have a criminal record in North Carolina and could be disenfranchised for years under this new proposal. 6. Banning “incompetent” voters from the polls. Anyone given such a designation from the state will be unable to cast a ballot, “even if the person’s mental health issues have nothing to do with their abilities to understand voting,” writes Rob Schofield. 7. Ending straight-ticket voting. In 2012, 1.4 million Democrats and 1.1 million Republicans in North Carolina voted a straight-party ticket. Eliminating this convenient form of voting will likely hurt Democrats in down-ballot races. Yet North Carolina is becoming increasingly diverse and more competitive in presidential elections. People of color accounted for 61 percent of the state’s 1.5 million new residents over the past decade. Since 2008, the black and Hispanic share of eligible voters in North Carolina has grown by 2.5 percent, while the percentage of the white vote has decreased by a similar margin. North Carolina has the largest population of African-Americans of any swing state. The aim of the new voting restrictions is to dampen the turnout of young and minority voters in order to consolidate power for conservative big-money interests. “Following the 2012 election, the Republican strategy is ‘if we can’t win national elections, we’re going to sew up everything at the state and local level,’’’ says Anita Earls. As a result, Republicans control a hefty majority in the legislature, and Pope is deputy budget director under GOP Governor Pat McCrory. One of the key sponsors of the new voting restrictions, freshman Sen. Bill Cook, received $104,836 from Pope and Pope-allied groups during his 2012 election race. Moreover, “the John W. Pope Civitas Institute, which receives more than 90 percent of its funding from Pope's family foundation, has been the state's leading policy advocate for voter ID restrictions and dismantling the state's clean elections programs,” writes Chris Kromm, director of the Institute for Southern Studies. Thirty-three members of the North Carolina general assembly are also members of the American Legislative Exchange Council, which has distributed draft voter ID legislation for GOP legislators. ALEC named North Carolina Speaker of the House Thom Tillis a “Legislator of the Year” in 2011. Forty of one hundred counties in North Carolina are subject to Section 5 of the Voting Rights Act and must have their voting changes approved by the federal government. The central contention of opponents of Section 5 is that the South has changed to the point where constitutional protections for minority voters are no longer needed. But recent evidence, like the flurry of legislation introduced in North Carolina this week, shows that past remains present to a disturbing degree in the South. Eight of eleven states in the Old South have now passed voter ID laws that disproportionately impact voters of color. The first states to pass new voter ID laws in 2013 were Virginia and Arkansas. North Carolina is likely to soon follow suit. It would be particularly ironic if the Supreme Court overturned Section 5 at a time when voter suppression efforts are spreading throughout the South in ways unseen since the Jim Crow era. Just this week, North Carolina Republicans proposed adopting an official religion for the state, counties and towns. Soon enough, they’ll once again be limiting the franchise to white male Christian property owners. Read more on the states that have drafted voter suppression measures in Ari Berman's last post.